When it Comes to Your Property's Exterior, We've Got You Covered. With our five-star CertainTeed accreditation, we're one of the few contractors in the St. Louis area that can offer the SureStart Plus Extended Warranty. This means you get the best coverage available, with protection for your entire roofing for up to 50 years! 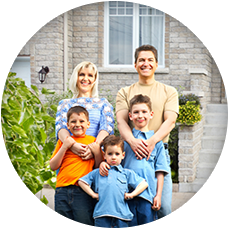 Hear What Our Happy Clients Are Saying! This is by far the most reputable and dependable contractor I have worked with. We were in a time crunch and not only did they take the time during their busiest season to take care of me but the owner took his personal time to explain every step of the process to me. There were no dumb questions and I never felt rushed into a decision. I will be using them again when a needed arises. Hail, wind, and storm damages are considered an insurance loss on your homeowner’s policy. It is the responsibility of the insurance company to pay the entire cost for replacing the roof or other parts of your house if damages are found. However, the entire process can get confusing, especially when adjusters don't communicate well. One of our roofing insurance claim specialists can visit your home to assess your roof’s condition and provide you with a detailed plan of action - and do all the talking for you! Providing Superior Roofing & Exterior Renovations to the Greater St. Louis, MO region and the Surrounding Areas for Over 15 Years! Edward's Roofing and Exteriors (formally known as Edward's Roofing and Repair), has built a strong reputation being known as one of the premier roofing contractors in the St. Louis area. We have been serving the St. Louis, Hillsboro, St. Charles, Town and Country and Jefferson Counties and pride ourselves on our quality work and craftsmanship. From roofing to siding, you can count on Edward's Roofing and Exteriors to be your one-stop-shop for all your home and business renovation needs. Whether you have a new construction or a remodel, we'll handle any job! We follow our motto of “there's a solution for every customer", and we'll never up-sell or charge you for additional products that have not been discussed during the time the estimate is being provided - that's our promise to you! Make the Best Decision for Your Property and Choose Us! Our goal is to make sure we always meet our customers’ needs and provide the highest level of satisfaction with the work that has been completed. Our mission is to build positive relationships with our customers by making sure we have established a good level of communication and our customers understand that we work hard to keep costs low. We are properly licensed, insured and have a proven reputation about our commitment to ongoing training to keep us current in new roofing and exterior technologies. Your home and business is considered a vital investment, and it should always be treated with care to ensure the structure remains safe. Your roof serves as a form of protection from the outside elements such as rain, hail, sleet, snow, and animals. 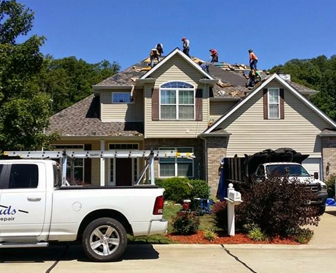 When the time comes and your roof requires repairs or a completely new roof system needs to be installed, Edward's Roofing & Exteriors is the business to call. 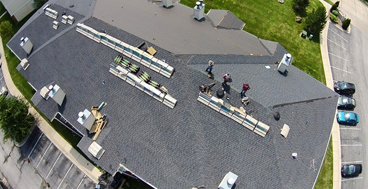 Our team has many years of experience in the roofing and exterior industry and understands the importance of paying close attention to detail. Edward's Roofing & Exteriors uses only top of the line materials, giving you the security that you’re backed by a 100% guarantee from the owner himself and the manufacturer! Our goal isn’t just to make sure that your siding is installed the best that it can be. We strive to offer our customers with many different siding options, because we realize that no two properties are the same, and we encourage our clients to embrace their own style! We offer vinyl siding, aluminum siding, wood siding and composite siding for any residential or commercial property. Learn more about our siding services for your next project! When you add one of our decks to your home, you are not only adding aesthetic value, but increasing your property value as well! Whether you want a place to gather for family picnics, to add a lounging area to your pool or simply want a place to enjoy the evening breeze, one of our high-quality decks are perfect for outdoor entertaining and extra living space! If you are planning a new deck project, we offer free estimates as well as financing options. To receive a FREE estimate on your next roofing, deck or siding project, contact us today! When it comes to your home or business property's exterior - experience is everything. Browse our gallery of past work to see what we've done for other properties in the area.